Delicious Peach BBQ Meatballs are quickly tossed together to cook in the slow cooker for a tasty game day recipe or easy weeknight dinner! Packed full of protein, these are the perfect combination of sweet and smoky. Whether dishing them up for dinner, serving them at a party or as a game day appetizer, we are huge meatball fans here at The Love Nerds. 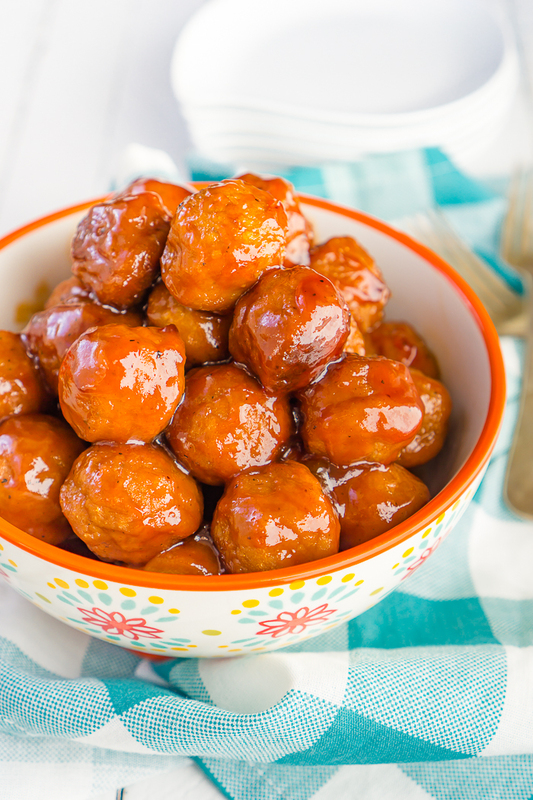 Meatball recipes – like this recipe for Peach BBQ Meatballs – are some of the easiest recipes! 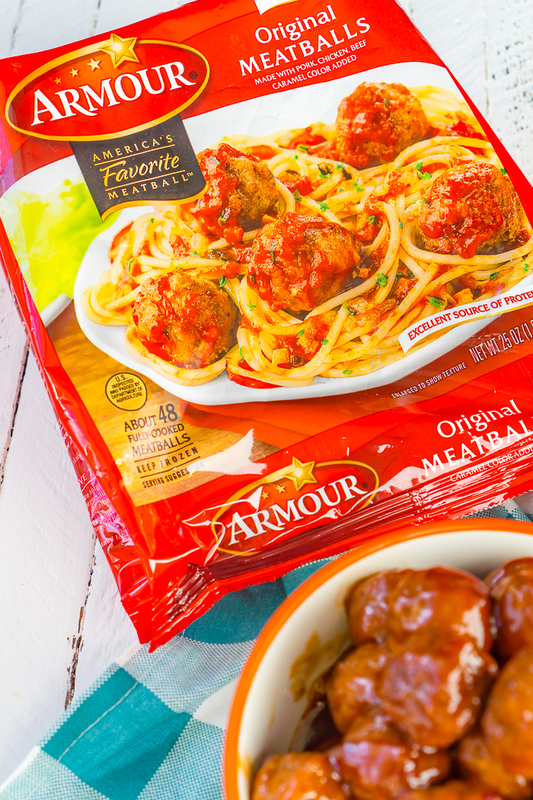 It’s made even easier by using quality brands like Armour® Meatballs. If you follow along with us regularly, you know that we love easy recipes! We are just too busy (and currently too pregnant) to stand in the kitchen for hours prepping food. I want quick, easy and delicious! Without time to prep meatballs from scratch, Armour Meatballs are an easy solution for any dining occasion. They are fully cooked, heat and serve meatballs that are an excellent source of protein. Just look for them in the freezer section of your Jewel-Osco or local Albertsons banner store. The bag even has recipe ideas for you! 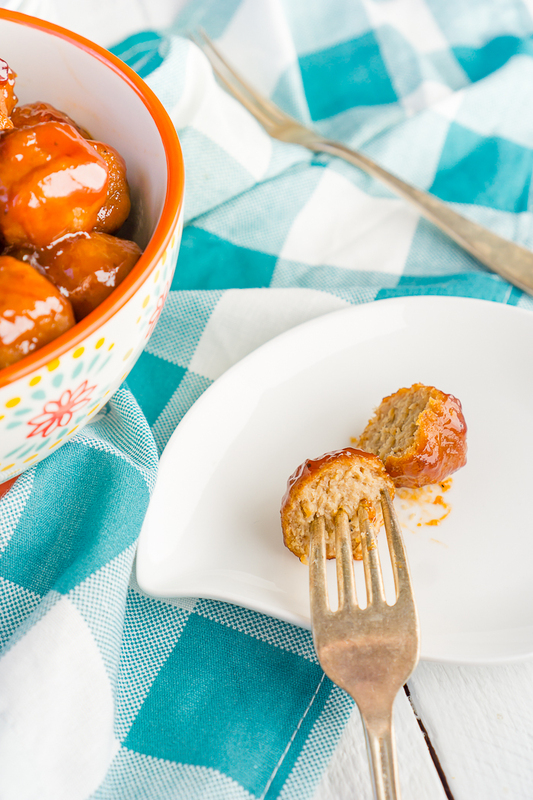 When enjoying these Peach BBQ Meatballs, we like serving them on top of brown rice or cauliflower rice with a salad on the side. If you are planning on serving them up as a party appetizer or as game day food, just put out toothpicks and you are good to go! They are delicious all on their own. Of course, if you are wanting to add a little something else, you can always provide Hawaiian rolls to make sliders. Speaking of game day! Armour Meatballs is offering a fun sweepstakes. You should enter now for a chance to win one of five football jerseys or one of ten $50 gift cards! First, you will need to gather your preferred BBQ sauce, peach jelly, and ground mustard. Add all of these to your slow cooker and stir thoroughly to make the sauce. You might still have chunks of peach jelly within the barbecue sauce but that will incorporate better as the sauce heats in the slow cooker. If you are thinking peach and barbecue sauce is a weird combination, just give it a try. Trust me! I find smoky BBQ sauces pair best with sweet peach jelly. Then, you will need to add your Armour Original Meatballs to your slow cooker and toss with the sauce. Cook the frozen meatballs on high for 2-3 hours, stirring occasionally. If you need to keep them warm for a party, turn the slow cooker down to warm to prevent the sauce from burning. There are many products I love using as shortcut ingredients, such as using Armour Meatballs instead of making them from scratch. I find them just as flavorful and it saves me a TON of time. TIME TO COOK UP A TASTY BATCH OF PEACH BBQ MEATBALLS! 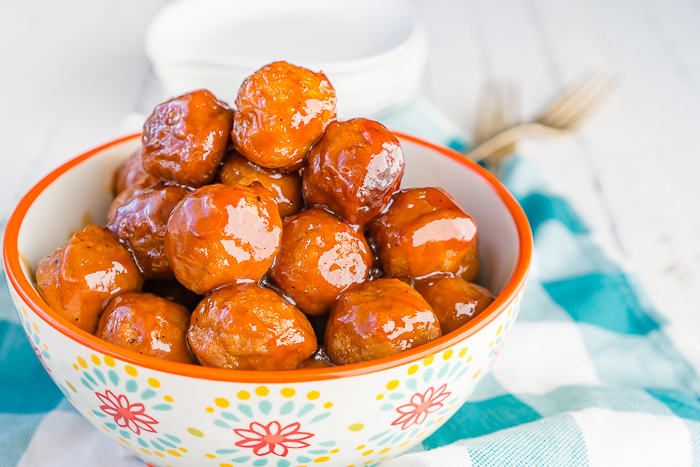 Packed full of protein, these Peach Barbecue Meatballs are the perfect combination of sweet and smokey. Great for dinner, party appetizer and game day food! Thoroughly mix all the ingredients together other than the meatballs in the slow cooker. Add meatballs and stir until well coated. Cook frozen meatballs on high for 2-3 hours. Stir a couple times throughout for even cooking and to prevent sauce from scorching. Once meatballs are cooked thoroughly, turn the heat down to ensure they stay warm and don't overcook.